If you purchase a ticket to the Print Matters Workshop Event on Sat Feb 18. You get into the talk for FREE! You do not need to reserve a ticket for the talk. 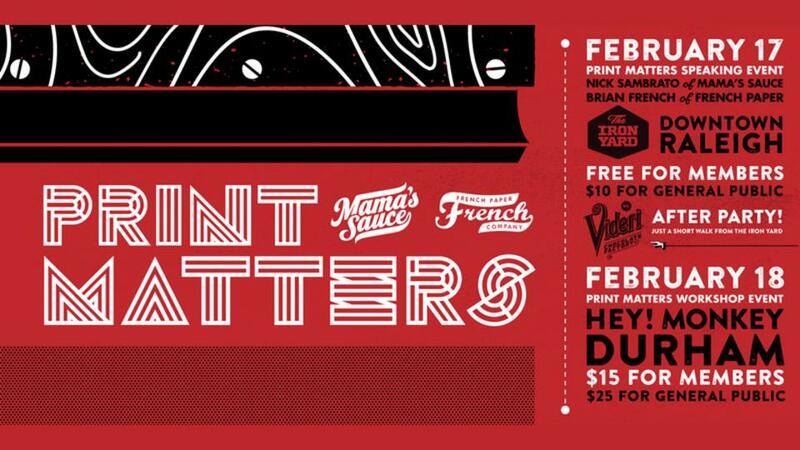 One will be sent to you before the 17th of Feb.
Building on their amazing stories from the Print Matters Speaking Event Brian and Nick will help you get your hands inked up with a hands-on experience of printing your very own PRINT MATTERS poster (designed by Lenny Terenzi of Hey! Monkey). Print Matters is a speaking & workshop event(s) comprised of tales from Brian French, 6th Generation French Paper Company, and Nick Sambrato, Mama's Sauce founder, about their respective companies combined 150 years (143 of those from French alone) of producing paper and printing in an ever modernizing world. Both companies are not just manufacturers, each has become a part of the design community.